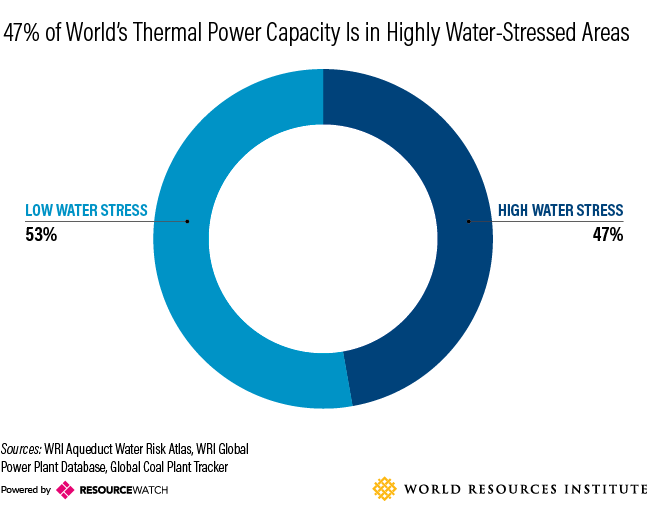 When we overlaid areas of current water scarcity with existing power plant infrastructure, we found that 47 percent of the world's thermal power plant capacity—mostly coal, natural gas and nuclear—and 11 percent of hydroelectric capacity are located in highly water-stressed areas. That's a problem because both thermal and hydroelectric power are highly dependent on water to produce electricity. Thermal Power plants in areas lacking ample water supplies are vulnerable to power disruptions from drought and increased competition amongst water users. We're already seeing this energy-water tension play out in some countries. Previous WRI research found that 40 percent of India's thermal power plants are in water-scarce areas. Between 2013-2016, water shortages caused shutdowns in 14 of India's 20 largest thermal utilities, costing the companies $1.4 billion. In 2016 alone, the country lost about 14 terrawatt-hours of potential thermal power generation, equal to the annual electricity demand of Sri Lanka. Hydroelectric plants currently produce about 16 percent of the world's power. Reduced streamflow can significantly curtail the amount of electricity they can generate. Reservoirs that hold water for hydroelectric power generation also have large surface areas, making them more susceptible to evaporation than rivers. 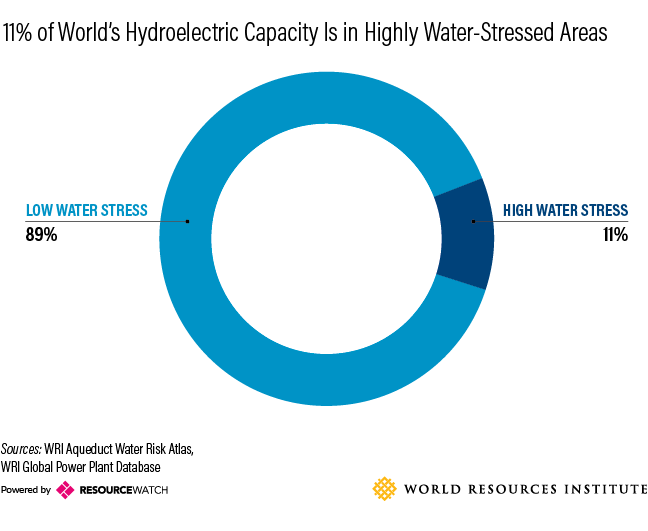 While only 11 percent of the world's hydroelectric plants are in highly water-stressed regions (likely because hydropower plants are strategically built in regions of higher water availability), they're not immune to water-induced threats. The current drought in Kenya that began in 2017 has caused repeated power shortages and higher electricity prices. Countries like Brazil and Kenya are highly dependent on hydroelectric power ( 70 percent and 39 percent, respectively), so their power systems are at a high risk of experiencing power shortages and rising electricity costs in years of persistent drought. The tension between energy production and water availability will grow only more severe in the coming decades. Freshwater withdrawals from the power sector already represent 18 percent of all water withdrawals globally; in developed countries like the United States, this number can be as high as 40 percent. Under some scenarios, water demand from the power sector in the developing world is expected to grow dramatically from 2010 to 2050—up to 350 percent in Asia, 360 percent in Latin America and 500 percent in Africa. While the world's needs for water and power increase, water stress is projected to rise in many regions due to climate change and population growth that will bring greater water demands from agriculture, industry and cities. The power sector is also the single-largest contributor of carbon dioxide emissions, fueling the climate change that will exacerbate the world's water woes. Understanding the causes of and solutions to water stress is a complex undertaking. Many factors affect waterstress, including precipitation amounts and patterns, management of demand, pollution levels and the laws and regulations that govern water's use. The relationship between water and power is therefore a complex one, with numerous sources affecting water stress. Granular information on agricultural and domestic water use and power plant water consumption is essential for integrated planning and risk reduction. The data for this global analysis is now available on Resource Watch, a new platform that allows users to visualize hundreds of data sets, including global water stress and open data on power plants. Understanding water availability's potential threats to individual power plants, though, requires more detailed information. For example, to assess a thermal power plant's vulnerability to water stress, we would need to know the precise type of cooling system it uses, if it accesses sea or fresh water, and the total amount of electricity it generates on an annual basis. Most countries and companies don't provide this information publicly, so there is a need for more open data. View water stress, power plant locations and other data sets on Resource Watch.